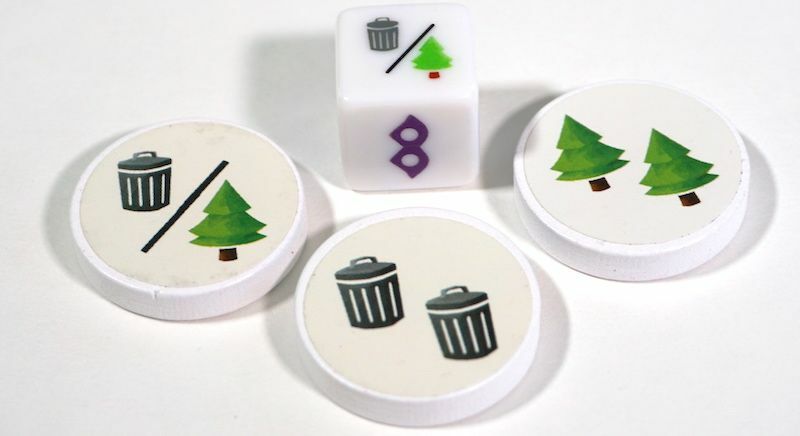 Trash Pandas is a press-your-luck, dice-rolling game designed by Michael Esuke of Red Rook Games. Trash Pandas is getting its first major release by Gamewright Games this summer. Players become raccoons digging through trash. I hesitantly delved into this one because neither of these genres are favorites of mine. Did I find the game itself deserved to be thrown into the trash or stashed away in my game closet like a shiny treasure? Setup is fast and simple. Depending on your place in the starting turn order you begin with a certain number of cards. Array six tokens, one die, and the deck of cards on the table. The cards in your hand represent various garbage or other things (like dogs and cats) you have at your disposal as a trash rummaging raccoon. Each player takes turns rolling the die multiple times in a row. As you roll a symbol you take the matching token, indicating you’ve acquired that action so far. You only truly gain the actions/tokens when you decide to stop rolling. Rolling the same symbol twice results in a bust where you lose every token you’ve gained. Once you’ve stopped rolling you may resolve tokens gained in any order you choose. The actions and/or tokens you gain allow you variations on gaining cards for your hand and “stashing” cards face down for end of game scoring. Six types of cards offer a choice. Players can either stash the cards for victory points or use the cards to perform actions. Two types only have value as an action card. When the deck runs out, that player finishes their turn and the game ends. Everyone then discards all leftover hand cards. 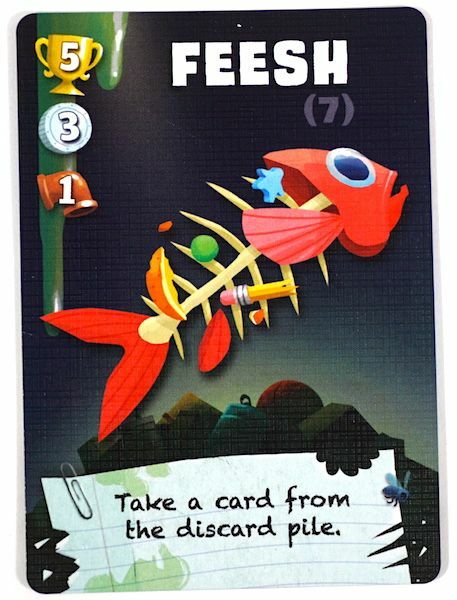 All players turn their stashed cards face up to see who has the most of each type of garbage, which each has its own unique 1st, 2nd, and 3rd place scoring ranks (example: Feesh: 5 points for 1st/most, 3 for 2nd, 1 for 3rd). Whoever scores the most total points from all their stashed garbage cards is the most illustrious raccoon hoarder (winner). Trash Pandas does involve a good dose of luck since your turn consists primarily of rolling a die. However, there are definitely strategies to be employed. There are two fun balancing acts. First, a balance between greed and moderation in the dice rolling. It’s important to know when to quit and when to just go for it. The second balancing act is between stashing cards for points and keeping them for the actions they offer. For example, to avoid a bust the Blammo card allows you to try another reroll and the Nanners card allows you to ignore your bust roll and stop. Not having these in your hand makes you more cautious rolling, while a bunch of Blammo cards allows you to brazenly keep rolling. 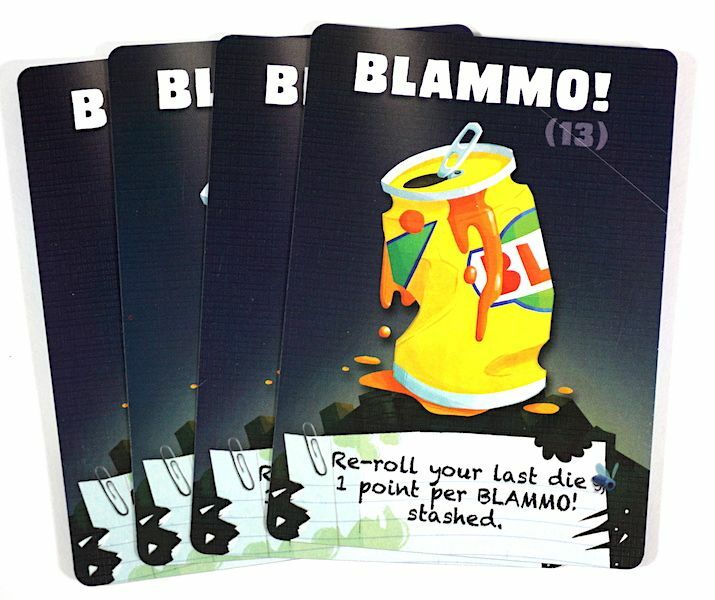 The proliferation of Blammo cards gives you options – so it’s not purely dice rolling luck. 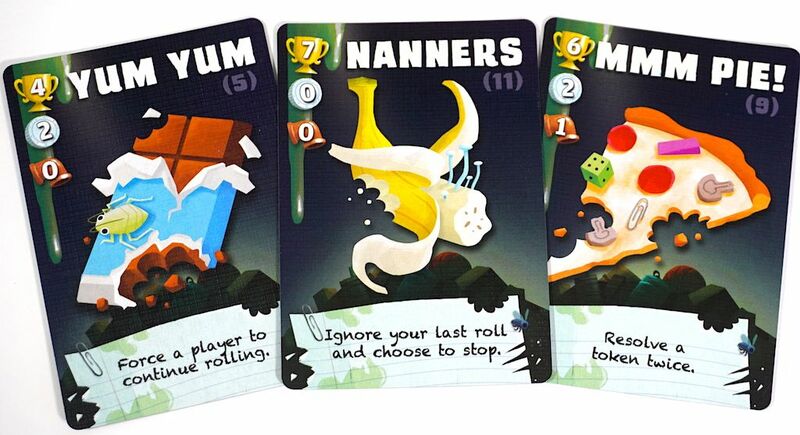 Humorously, the Yum Yum card can be used to force another player to keep rolling even if they want to stop. If they don’t bust it’s a laugh because you tried to harm them but gave them a benefit instead. The powerful Kitteh and Doggo cards should be saved for just the right moment. 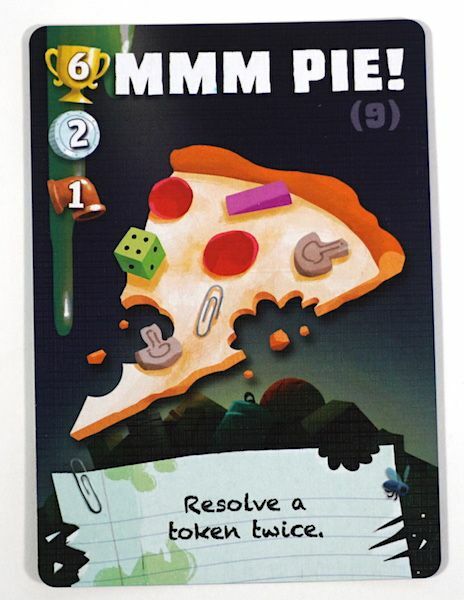 The “Mmm Pie” card allows you to resolve one of your tokens twice. This can be a massive benefit, to double the “Stash Two Cards” action to stash four cards. 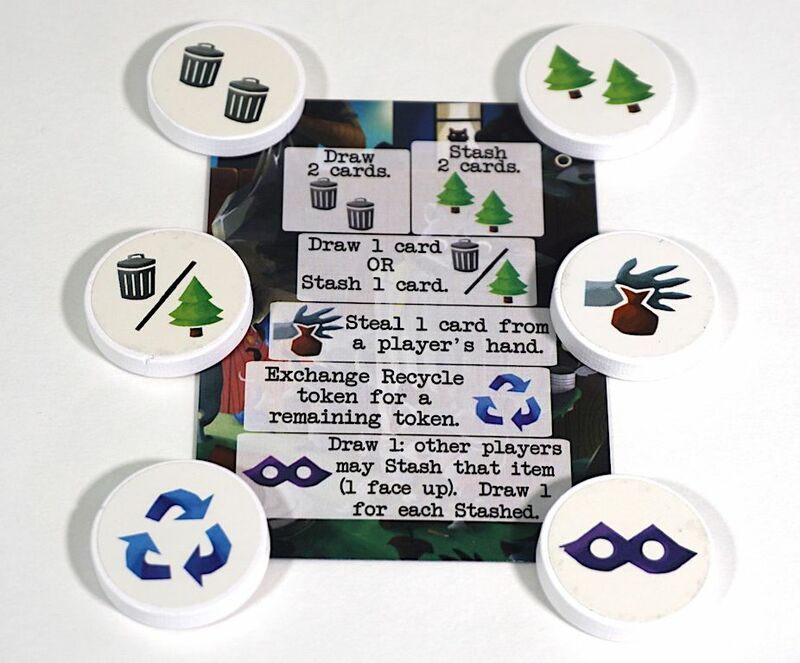 The Recycle action is a particularly important token to the game as it gives players more strategic choice. Players can use a Recycle card to to choose from any of the remaining/unrolled symbol tokens. Besides the sizable luck of the roll/draw and some cards being much better than others, there’s not much wrong with the game. Not being able to use the actions from cards you drew on that turn is a little fiddly to track, but this rule is needed. A house rule to give someone two consolation cards if they bust after gaining only one token could be a good addition. There are 9 of these cards in the deck. How many do you need to stash to get the 6 points for “most cards”? Most card stashing (unless affected by the Bandit Mask) is blind. This removes some of the strategic element but also adds some suspense. Thankfully, the ‘quantity of cards’ indicator after the card’s name in purple parentheses allows you to take a statistical stab at how many you need to stash to guarantee a majority. (Reminder, the player with the most of a certain type of garbage gets the first/highest points – see the “Mmm Pie” card at right). The game creates a very enjoyable semi-unique combination of elements with very regular game mechanics which have been around for years. It’s got lots of luck but it’s very fast and fun, so it’s therefore acceptable in my book. If you don’t mind luck in your games this is a very good quick “Take That” card game. Pressing your luck all on your own is a nice change (hearkening back to the classic game Can’t Stop). It’s still suspenseful for fellow antagonistic raccoons who want you to bust so they can get the best garbage. It’s so simple – don’t repeat what you’ve rolled. The cards allowing actions –OR- stashing for points creates a fun now-or-later decision-making dynamic. The humorous card names (as if that’s what the raccoons would call them) and trash images contribute well to the funny theme of this game. Likewise, the stealing of cards from your fellow raccoons (hey, it’s a raccoon-eat-raccoon world out there) and pressing your luck “digging just a little deeper into trash can” also fit the theme very well. Despite not coming anywhere close to winning any of the games of Trash Pandas I’ve played, I still had fun – the sign of a good game. It was probably because I was too timid of a raccoon in my rolling. Next time I’ve got to get in there and dig to get more of that good garbage! Find Trash Pandas at Amazon or your local game store. 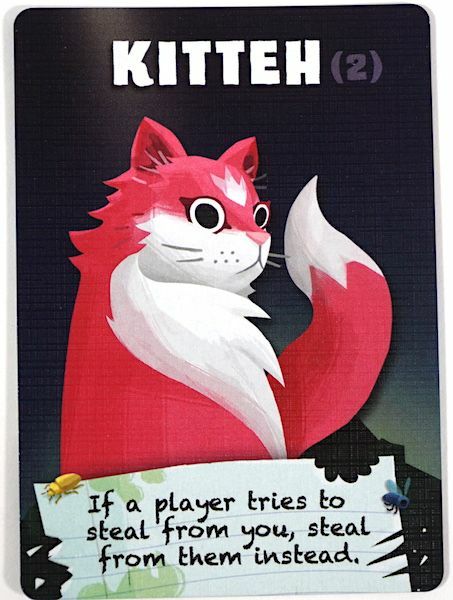 The Family Gamers received a promotional copy of Trash Pandas for this review. Pictures are from the Red Rook edition and may differ slightly from the Gamewright release.